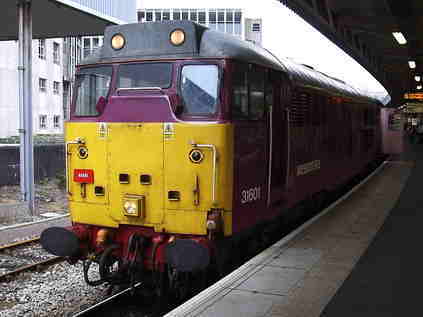 Reportedly, today was the last day of Class 31 hauled services to Weymouth. Naturally, quite a lot of cranks planned to show up - and a general convergence on Temple Meads this morning made for something of an event atmosphere. Problem was, the Peds are back next week! Wessex reportedly have in excess of twenty units out of traffic - including the burned-out 143623 which is surely destined for scrap. Also, lets not forget 150234 which met a tractor near Newquay. I get the feeling there maybe several 'last ever' trains before this year is out - notwithstanding the plan to do away with locomotives on the FO Brighton run in December. Still, I've not been to Weymouth for a while. I've not done it often over the summer, firstly due to the diversion of other things, and I confess I find parts of the run almost unbearably dull. I'm not sure why - I always have. The traction has often made up for this, and perhaps I will eventually get around to scanning shots of Class 37/4s on the 'Sand and Cycle Explorer' back in the mid-1990s. Today - overall, a good run - some of the best timekeeping on this route I've ever noted. Some interesting stuff at Westbury including half of the 59/2s, now here having moved home from Hither Green. 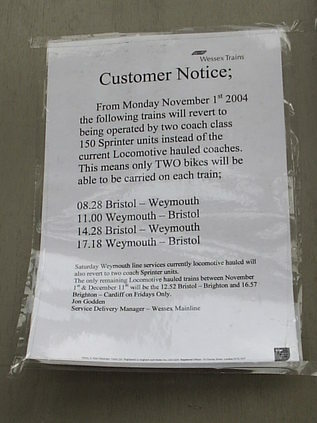 The indistinct bit at the bottom hints at December 10th being the last hauled Brighton service too. Weather varied wildly during the return journey. Had a notion I'd get one of the Virgin shuttle services up to Gloucester and see if there was a chance of heading to Newport. Plenty of time to board the very late 221114 which was languishing without a driver. Nothing of note happening at Gloucester, and with the blockade between Cheltenham and Birmingham, few options. Back onto the Voyager for Bristol. Train Manager struggling hard to explain that as well as the coach journey that passengers had just endured due to planned engineering works, they may have to do another one if they were heading west of Exeter due to last week's events! Brief wander around a chilly and deserted (though mercifully dry) station before heading back to Weston.